Home / Cardio Training / What Type Of Cardio Is Best For You? WHAT TYPE OF CARDIO IS BEST FOR YOU? AND KEEP YOUR HART RATE BETWEEN 50% TO 80%/of your max. ARE YOU DISAPPOINTED WITH MY ANSWER? READ THE TEXT BELOWE AND YOU WILL UNDERSTAND WHAT IM SAYING! 1.IT ELEVATES HART RATE TO 50-80% OF YOUR MAX. 2.IT KEEPS HART RATE ABOVE 50% AT LEAST 20 MIN. People often say their weight lifting workouts are exhausting and ask if they count as cardio. No! (The one exception is hybrid workouts) – lets look at why. Typical weight workout is longer than 20 minutes in duration so it satisfies the definition of cardio there, but the heartrate rest between sets, its drops to almost the resting heartrate. To be cardio, the heartrate has got to stay above that 60% line for the entire 20 minutes!. STILL NOT GETTING IT? LETS TRY THIS WAY! If you run a 6 minute mile, your heartrate will hit 85% or more while running but within a few minutes of stopping it will be down to your resting heartrate again. It fails the second criteria because it will only elevate your heart rate about 8 minutes not the 20 minutes required- running a mile is not good cardio. If you find jogging boring, what you can do though is interval training (HIIT). Sprint a minute, rest 30s, repeat for 20 minutes or more. When you are resting, your heartrate slowly decreases but it stays above 60%. If you are doing HIIT and your heartrate is dropping below 60% at any point then you are resting too much. So if you are wondering if a particular activity is good cardio, its simple to find out. Do it for a minimum of 20 minutes then measure your heart rate and compare it to the above chart. If your heart rate is in the target zone (50%- 85%), then it’s good cardio – simple as that. With many forms of cardio, like cycling or walking, its easy to get lazy and just lolli-gag along. Its important that you monitor your heart rate during the cardio to make sure that you are not slacking off. FIND YOUR OPTIMAL HART RATE FOR CARDIO ! Your fitness level determines how efficient the heart is at pumping. The stronger the heart, the greater the volume. The Resting Heart Rate depends on your age and fitness level. 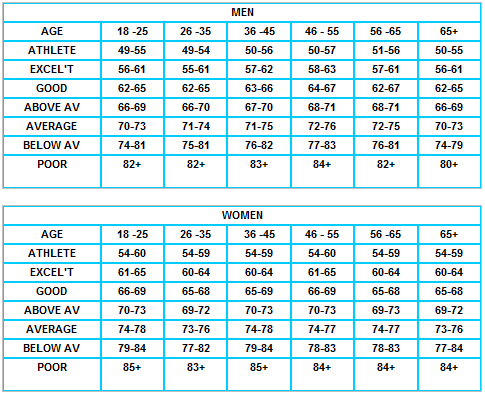 See the tables below to get an idea of your fitness level. When you start out with exercising, you are advised to start slowly, for instance just walking. Increase the distance/time gradually. Walking after a meal will help you reduce weight. You must check your heart rate while exercising. It is easiest to check at the neck. Place two fingers just beside the Adam’s apple and you will feel the pulse. Be careful not to press too hard. There are also many heart rate monitors that makes it easier and more accurate to check your heart rate. As a rule of thumb, the predicted maximum heart rate, 100%, for a man is 220 minus his age, and 225 minus her age for a woman. 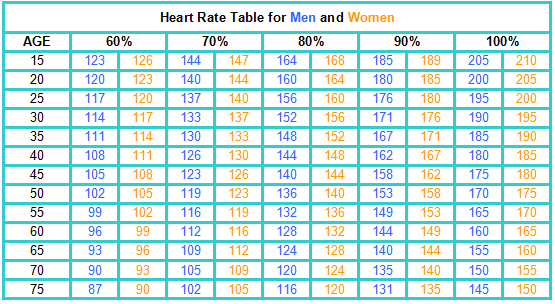 The table above displays the different heart rate levels as a function of age. Use heart rates in the 60-70% range for Fat Burning, the 70-80% range for Intermidiate Aerobic exercises, and the 80-90% range Cardiovascular Performance exercises. However, please note, unless you are extremely fit, avoid exceeding 85% of your maximum heart rate as this increases both your cardiovascular and orthopaedic risk and does not add any extra benefit. You will notice that as you get more fit, it is harder and harder to get your heart rate up. This simply is an indication that you are getting fitter. AND FINALLY, CHOSE DIFFERENT TYPES OF CARDIO AND START WORKOUT ! ! If you are a beginner, don’t get bogged down in this stuff. For you cardio means walking, jogging, cycling or swimming 20-40 minutes every day – period. For advanced sports training, there are other types of cardiovascular workouts which involve intervals – repeated bursts of 100% effort punctuated by short rests. Interval training can increase your VO2 Max and increase your speed but for beginners, intermediates, or overweight people it often results in pulled muscles or joint injuries. So lets start here with advanced cardio workouts ! ! PLEASE LIVE A COMMENT BELOW IF YOU LIKE THE ARTICLE, LIKE, SHARE AND SUPORT US !